Ameca is a municipality in Jalisco, Mexico. While researching several of my ancestors this book kept coming up as a reference. I searched for it on Amazon but was discouraged by it's price since it is a rare out of print book. Fortunately, Google has digitized it and it is available for free download through them. Before I provide you with the link to it let me tell you more about this book and some of the ancestors that I found mentioned in this book. I was pleasingly surprised to find my 11th great grandparents Juan Guerra de Ressa and Magdalena de Mendoza listed in it. I would have never thought to look them up in land titles in Jalisco. The book is divided in several parts, it first starts with a historical overview and then it provides information on land titles given to some of the earliest conquistadors of Mexico and or Jalisco. 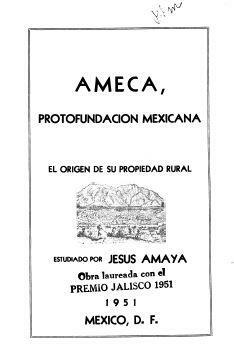 The book also includes a biographical dictionary of places and people related to Ameca, Jalisco on it's appendix. If your ancestor is mentioned you can expect to find family information on them. On one of my ancestors it even mentioned the names of the grandparents and some of his brothers. Some of the people mentioned in this book also went into New Mexico with Juan de Onate so some of the names might sound familiar. While the title states Ameca, don't be deceived since it covers a much wider area surrounding the current municipality. Also, it wont hurt to look for your ancestors in this book. I hope that this book provides you with clues to find more of your ancestors.